Mark Teixeira, traded from Texas to Atlanta at the deadline, began play last night with 10 home runs in 81 August at-bats. The Red Sox as a team began play yesterday with 13 home runs in 736 August at-bats, a power outage that threatened to be their worst for any month in eight seasons. The Sox took steps to rectify that shortage. Jason Varitek took Mike Myers deep for the team's 14th home run this month in the ninth inning of Game 1 of the doubleheader, and David Ortiz hit two and Kevin Youkilis one in the second game of the 11-3, 10-1 sweep of the White Sox. The Red Sox have not hit fewer than 20 home runs in a month since August 2000, when they had 18. That month, Carl Everett hit 6, Brian Daubach 5, and Nomar Garciaparra 2; no one else had more than one. This month, Ortiz leads the club with five home runs. Five players have two -- Mike Lowell, Dustin Pedroia, Doug Mirabelli, Varitek, and Youkilis. Manny Ramírez and Eric Hinske have one apiece, and three regulars -- J.D. Drew, Coco Crisp, and Julio Lugo -- have none. The fewest home runs the Sox have hit in a month this season was 26 in July. In the first four months, they haven't hit fewer than 26 or more than 29 (May). The most they hit last season was 42, in July; the fewest 21, in September, a month in which Ramírez barely played and Ortiz also missed time. Last night was just the third time the Sox have hit as many as two home runs in a game -- Ortiz and Pedroia went deep in Game 1 of the Aug. 17 doubleheader against the Angels at Fenway Park, and Mirabelli and Hinske went back-to-back against the Orioles at Fenway Aug. 2. The Yankees, by contrast, who lead the majors in home runs this month with 36 entering their game in Detroit last night, have had multiple home run games a dozen times this month, including a five-homer game Aug. 1, the day after hitting eight. Ramírez's chances of hitting his milestone 500th home run appear to be dimming. Needing 11 to join Frank Thomas and Alex Rodriguez as the newest members of the 500 club, Ramírez's only home run this month came Aug. 5 in Seattle off Miguel Batista, a span of 60 at-bats. He hit a ball with home run distance down the right-field line in the eighth inning of Game 1, but it went foul. He hit another with home run distance down the left-field line, but it curved foul also. His slugging percentage of .372 for the month -- .228 below the career .600 he took into the season -- wasn't helped by his two singles in Game 1. Drew's home run problems are well-documented: After failing to get the ball out of the infield in three at-bats in Game 1, he has now gone 165 at-bats (50 games) without a home run, the longest drought of his career. Yesterday, manager Terry Francona replaced him with a pinch hitter, Bobby Kielty, against lefthander Boone Logan with the bases loaded and no outs in the eighth inning. Drew did not play in the second game. Francona said for much of the season, he had counseled patience with the offense, believing that it would come around. "But 10-9 games are hard to win consistently," he said. "I'd rather have solid, healthy pitching, and maybe some frustration with the offense, than the other way around." 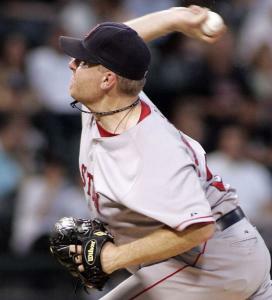 Curt Schilling remained undefeated in five games (three starts) in U.S. Cellular Field, where he is 3-0 with a 1.36 ERA. "Definitely improved," said Schilling, who gave up a double to Darin Erstad in the first inning of Game 2, and a home run to Juan Uribe and single to Andy Gonzalez in the second inning, but did not allow another hit before giving way to Manny Delcarmen at the start of the seventh. "Kevin [ Cash] and I had a pretty decent game plan. We mixed up my pitches well. I stayed out of the middle of the plate more than anything. Other than the home run, I think, I hung a couple of balls. The double that Darin hit was a hanger." Schilling, asked how familiar he was with Cash, said: "None. None at all. But I think we felt really good about what we were doing going in. I kind of let him run with it a couple different times." Jacoby Ellsbury hit safely in Pawtucket's games in Buffalo to extend his hitting streak to 20 games, a PawSox record. Ellsbury tied the record held by Dave Stapleton (1979) and Dave Berg (2005) by going 3 for 4 in the Paw Sox' 7-4 opening win, and broke the mark with a 1-for-3 showing in a 7-0 loss in the second game . . . Lowell has hit safely in his last seven games . . . Josh Beckett had not walked more than two batters in 13 straight starts dating to June 8 before walking three in the first inning of Game 1, the only walks he issued . . . Youkilis did not start Game 1, but delivered an RBI pinch single in the eighth, then doubled in the ninth. Pedroia also sat out the first game, but started the second game at second base . . . Kielty has been taking some ground balls at first base.